When you think of ramen, the picture of a dorm room and quick meal comes to mind. Banish that misconception with these healthy additions to any ramen meal. Ramen has a bad reputation for being very unhealthy. With a little creativity, though, you can make it a diet-saver! 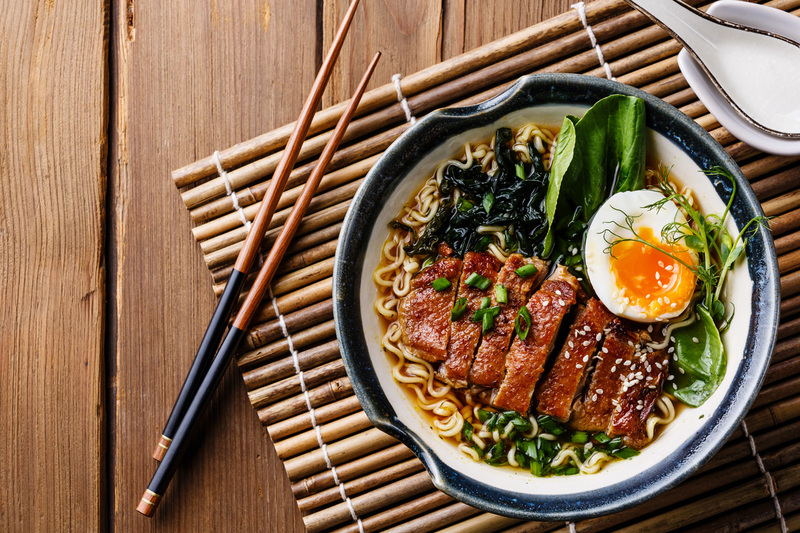 Ramen has become synonymous with the college student, sitting in a dorm room with a Cup Noodles or a little square of ramen and a seasoning packet. These quick meals are also really unhealthy. For the standard chicken flavored Nissin Top Ramen, one block is nearly 400 calories and about 70 percent of your daily sodium. A popular competitor, Maruchan, has slightly more sodium. For such a small packet, that’s a lot of damage to your diet. This doesn’t have to be the case, though. Instant ramen is great, because it’s quick and easy. With a few tweaks, you can turn your quick, salty Ramen fix into a superfood smorgasbord. When it comes to making ramen healthier, the first step will almost always be omitting the seasoning included. The seasoning packet accounts for 1120mg of the total 1660mg of sodium and 100 of the 380 calories. Removing the packet makes the dish much more reasonable. These will give you all the flavor of the high sodium packet, but with the benefits of a healthy broth. With that gone, the easiest way to add flavor is with a low sodium broth. You can even try a ginger broth for something a little different. These will give you all the flavor of the high sodium packet, but with the benefits of a healthy broth. All you have to do is boil the broth, throw in the noodles, and cook it like normal. If you don’t have a broth to work with, you can try seasoning the water with different flavors. For example, miso paste or low sodium soy sauce can really take your ramen to the level. You can also use spices or tasty additions like garlic or even sesame oil. So, you’ve ditched the packet and have a tasty, if plain, bowl of noodles in front of you. We can make this a more fulfilling meal by adding your favorite protein. Suddenly, instead of a quick snack, your ramen has become a meal that’ll keep you fuller, longer. You’ll want to pair the protein with a broth that fits. Chicken broth goes well with chicken, as do some seafoods and fish. Lean beef can be paired with beef or vegetable broths. Use your imagination, though, and try different combinations. You never know what’ll turn out amazing! Use your imagination, though, and try different combinations. You never know what’ll turn out amazing! Proteins are another way to add valuable nutrients and proteins to the meal. We’ve mentioned before how salmon is an excellent addition to any meal because of its benefits to your mind and body. Shrimp can be another powerful protein that’s packed with nutrients and low in calories. Even your chicken, the go-to meat ramen flavor, is an incredible addition to your dish. Chicken is low in fat, high in protein, and great for your heart and weight loss. One common ingredient in traditional ramen that’s often left off in the States is eggs. Whether you’re enjoying egg drop soup or a hard boiled or poached egg, it’ll add flavor and a healthy bonus. Proteins aren’t the only way you can add some flavor and substance to your ramen. Take any of your favorite vegetables and add them in. Frozen veggies can be an affordable, quick way to add a little something extra to the meal. It’s almost preparation-free, just thaw them out and add them to the broth. Think spinach or peas. Any of your traditional superfoods will not be out of place in your souped-up ramen. If you have a little time or desire to prep a bit, fresh vegetables are top class add-ins. Any of your traditional superfoods will not be out of place in your souped-up ramen. Seaweed is a common ingredient in Japanese cuisine. For a meatier ingredient, dice up some mushrooms. You can also slice up some kale into strips and use it like spinach. We haven’t even mentioned two popular options: peppers or sprouts. As you can see, it’s hard to go wrong when it comes to veggies in your ramen. Sauté the cubes of chicken breast, lightly seasoning with salt and pepper. Once the chicken is cooked through, place the chicken in a bowl and set aside. Add 2 tablespoons more of olive oil to the pan and begin sautéing the mushrooms, kale, peas, and garlic. Once the peas are thawed and the kale is wilted, set aside. In a large saucepan, bring 2 inches of water and the 2 tbsp of vinegar to a boil. Low heat and bring water to a gentle simmer. Crack one egg into a dish. Carefully slide the egg into the simmering water. Cook for roughly 3 minutes, or when the egg whites become firm, but not hard. Do not stir the water. This is a great way to break the egg. With a slotted spoon, lift the egg out of the poaching water and place on a paper towel to dry. At the same time, bring 2 cups of low sodium chicken broth to a boil. Add the ramen noodles, chicken, and veggies. Cook for 3 minutes, or until the ramen is at your desired texture. Spoon into a bowl and serve with poached egg on top. If you want to add a bit of spice, drizzle a little Sriracha sauce.